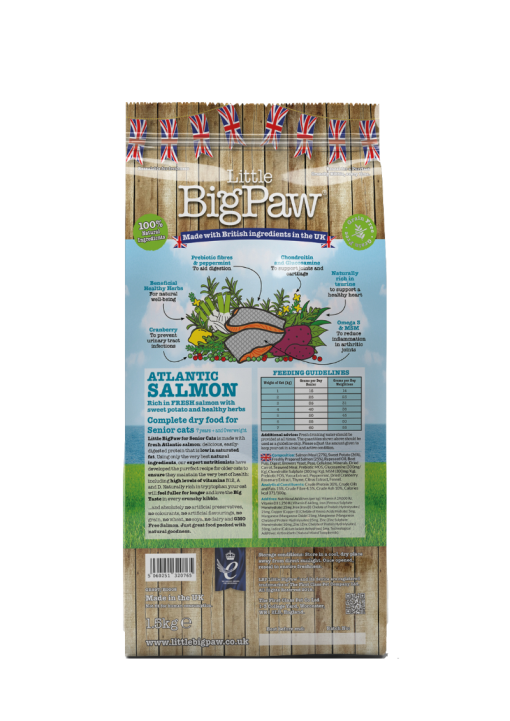 ATLANTIC Salmon Rich in FRESH salmon with sweet potato and healthy herbs. 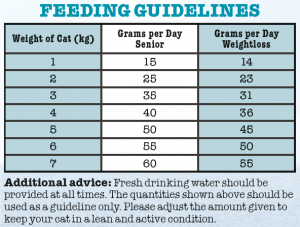 Complete dry food for Senior cats 7 years + and Overweight. 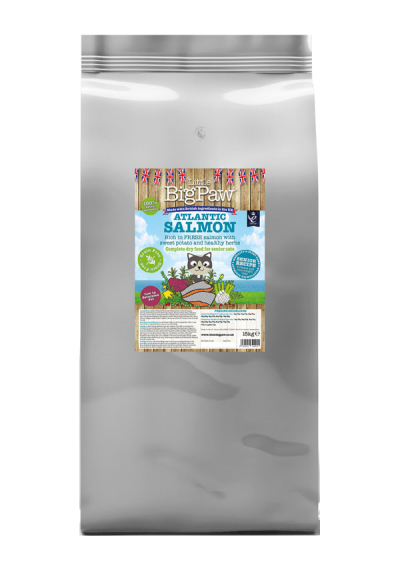 Little BigPaw for Senior Cats is made with fresh Atlantic salmon: delicious, easily digested protein that is low in saturated fat. Using only the very best natural ingredients, our expert nutritionists have developed the purrfect recipe for older cats to ensure they maintain the very best of health: including high levels of vitamins B12, A and D.
Naturally rich in tryptophan your cat will feel fuller for longer and love the Big Taste in every crunchy kibble. 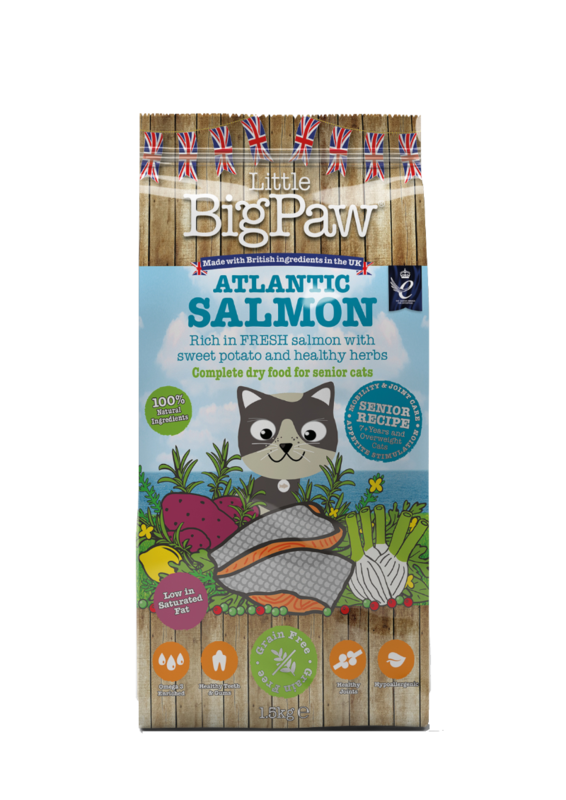 …and absolutely no artificial preservatives, no colourants, no artificial flavourings, no grain, no wheat, no soya, no dairy and GMO Free Salmon. 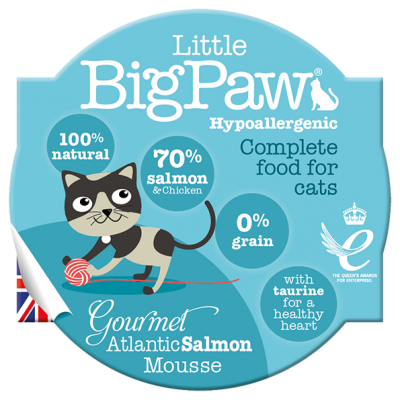 Just great food packed with natural goodness. 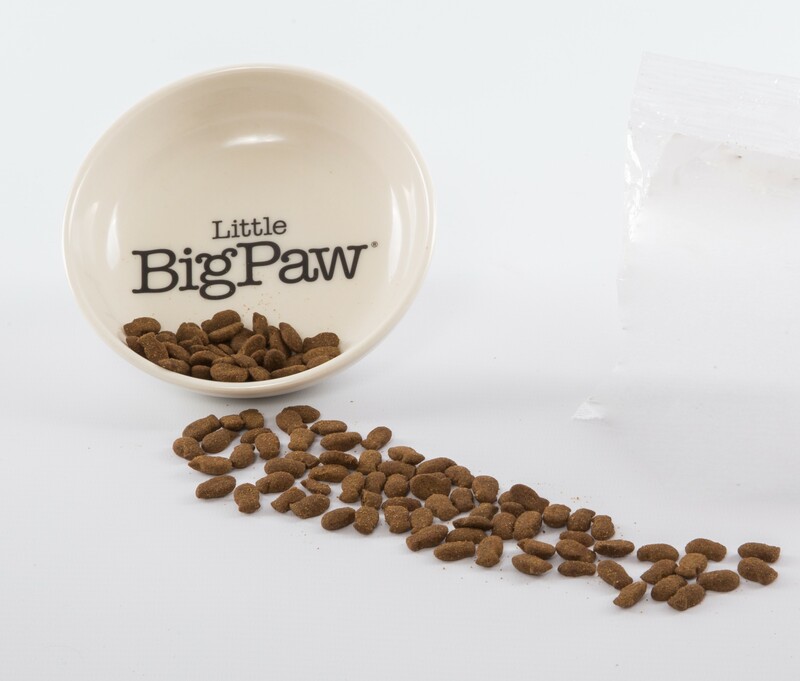 Analytical Constituents: Crude Protein 30%, Crude Oils and Fats 15%, Crude Fibre 4.5%, Crude Ash 10%, Calories kcal 371/100g. Additives: Nutritional Additives (per kg): Vitamin A 29,000 IU, Vitamin D3 1,250 IU, Vitamin E 640mg, Iron (Ferrous Sulphate Monohydrate) 25mg, Iron (Iron (II) Chelate of Protein Hydrolysates) 25mg, Copper (Copper (II) Chelate of Amino Acids Hydrate) 5mg, Manganese (Manganese Oxide) 25mg, Manganese (Manganese Chelate of Protein Hydrolysates) 25mg, Zinc (Zinc Sulphate Monohydrate) 50mg, Zinc (Zinc Chelate of Protein Hydrolysates) 50mg, Iodine (Calcium Iodate Anhydrous) 1mg. Technological Additives: Antioxidants (Natural Mixed Tocopherols).